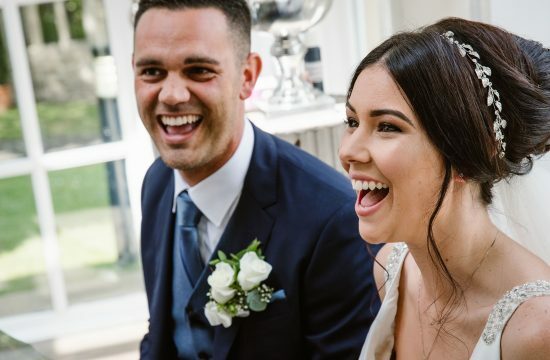 Leah and Andy got married in summer at the lovely St John’s Church in Ashbrooke, . They then had their reception at Bowburn Hall, which was the perfect setting. It was one of the most fun weddings I’ve shot and the sun shone all day long! Leah got ready at her mam and dad’s house with her parents, sister and bridesmaids, and the atmosphere was full of excitement. The girls were all buzzing about excitedly when I got there, enjoying the organised chaos of the wedding morning. She then took a fancy wedding car to get to the ceremony. The ceremony was a beautiful service in a nearby church. During the ceremony Leah’s sister gave a beautiful reading. It was such a personal service. The reception was in a beautiful room at Bowburn Hall in Durham. They chose the venue because it’s so cosy and relaxed and they just fell in love with it. It was a such a laid back wedding, which allowed everyone to just to enjoy themselves all day. I love shooting Bowburn weddings because the grounds are fab, the beer’s not extortionate and guests can just chill outdoors most of the day. The staff were amazing and couldn’t have been more helpful and the food was even better. 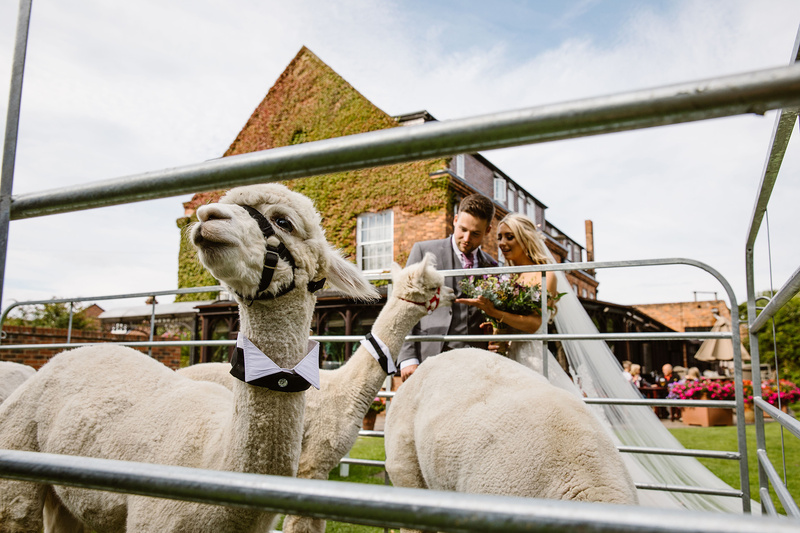 They had drinks in the gardens with a surprise appearance of some wedding alpacas arranged by Leah’s sister and mam in the afternoon, and a photobooth in the evening. Everyone loved feeding the alpacas who didn’t seem to mind the attention. For dinner they had proper wedding grub, which was loved by all the guests. I ate so much I struggled to get back up! The first dance involved the wedding party getting on the dancefloor to get the dancing going, and they finished off the evening with a dance off and some shots. It definitely was a lively one! The best part of the day was the speeches, because they were all brilliant. There was so many funny stories which had the guests creased. Leah wore a dress by Stella York and Andy wore a suit from Slaters and they looked so gorgeous. Leah’s shoes were a class of their own wit amazing tassels and her’s hair and make up were done by Katie Robson Make up and Studio 468. The flowers and button holes were from Ashbrooke Florists. The couple met through Leah’s brother who was one of Andy’s friends (awkward lol). 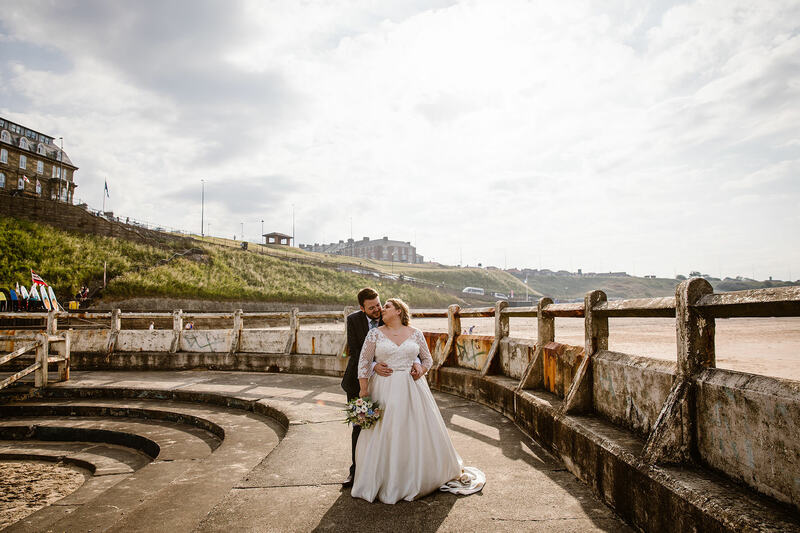 They got in touch with me after a wedding fair last year and their enquiry I met with Leah and her mam to chat through their day. They said they wanted a photographer who would be like a guest, and I loved that they were so relaxed. Leah and Andy’s wedding was such a laugh and the most fun. Here’s their awesome wedding! If you’re having a fun, relaxed wedding, get in touch!